It was in 1835 that the Bible was published for the very first time in the language of Madagascar. It had been translated by British missionary Davis Griffiths. At the time there were still few believers in Madagascar. The following year, the new queen, who became known as Ranavalona the Cruel (1828–1861), outlawed Christianity in Madagascar, expelled missionaries, and began persecuting Christians. Christians were forced to drink poison made from a local tree. The few that survived were declared innocent. As many as 150,000 Christians were killed in the next quarter century. But, instead of failing and shrinking without missionaries and in the face of persecution, Christianity grew. Bolstered by the Word of God in their heart language, the Christians of Madagascar stood firm. Through their witness and the witness of the Scriptures, others adopted their forbidden faith. After more than a quarter century of persecution, the next monarch reversed Queen Ranavalona’s course, declared freedom of religion and readmitted missionaries. Missionaries returned to find more believers and more vibrant faith than when they left. Today, half of the island’s people are believers. The story of the Scriptures in the heart language of the first Christians in Madagascar shows yet again the lasting and profound impact of the Word of God in the heart language. God did not promise that he would send out missionaries and they would accomplish all that he sent them to do, but he did say that about his Word. The impact of the translation of the Bible in Madagascar has come full circle. Meet Serge and Olivia Razafinjatoniary (rah-zah-feen-ya-tune-ee-ah-ree). 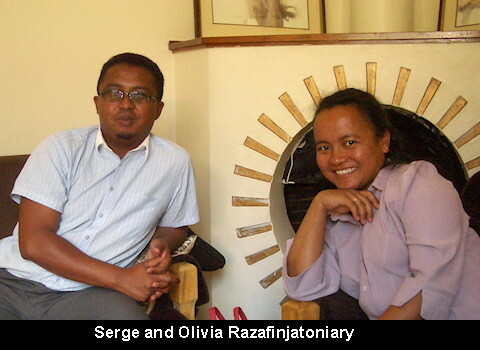 The Razafinjatoniarys are the first missionaries with Wycliffe from Madagascar. So the fruit of the translation done in 1835 is spilling beyond the borders of Madagascar, as it should. Dayle and I were so impressed with Serge and Olivia that we worked hard to get them assigned to work alongside us. In their first four years they have already had a significant impact for Bible translation. Serge coordinates the technical side of all the translation work in eastern Congo. Olivia is an expert in translation doing training and quality control. In addition, Serge is becoming an expert in the use software to speed translation work. They both have masters degrees from the Nairobi Evangelical Graduate School of Theology. I expect to see them have a broad and deep impact for the Gospel over the course of their careers. Other Africans involved in Bible translation of whom we are justly proud include Nessiel Nodjibogoto, Kabucungu Hand-jinga, Bungishabaku Katho, and Boureima Ouedraogo. They all fit in the category of “people whose commitment to the Lord is as deep as their names are long”. If you are interested in praying for them or giving to their ministry, let me know and I’ll put you in touch. 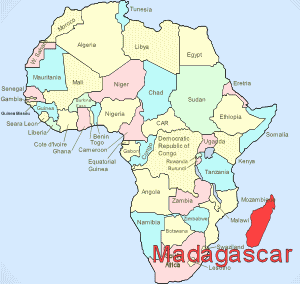 Trivia question – what is the adjective for something from Madagascar? Click here for the answer. This entry was posted in Africa, Bible, Bible impact, Faith now, Heart language, Religion and tagged Madagascar, Razafinjatoniary, Wydliffe Bible Translators. Bookmark the permalink.